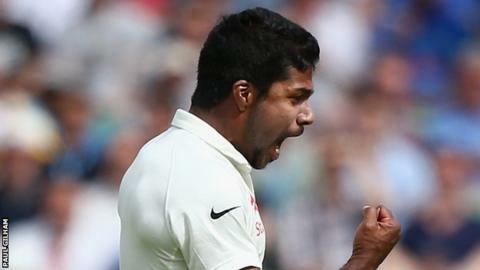 Durham have signed India Test paceman Varun Aaron for the final weeks of the County Championship season. The 24-year-old will replace previous overseas signing John Hastings, who is playing in the Champions League T20. Aaron will be available for Durham's four-day games at home to Northants and against Warwickshire at Edgbaston. He said: "I've always wanted to play county cricket and am looking to play next season. However, I am happy the opportunity has come sooner." The seamer, who has three Test caps and has made eight one-day international appearances, impressed during the recent Test series against England, taking five wickets in the final two matches. He struck Stuart Broad with a bouncer during the fourth Test, breaking the England player's nose. Durham head coach Jon Lewis said: "Varun has obviously got some good pace and he's young and keen. "He didn't start the series [against England] but came into it halfway through and made an impact because he brought genuine pace to their attack, which they didn't really have early on. I'm sure Stuart Broad remembers him! "It bolsters our seam attack as we are a bit thin on the ground at the moment."